GLAD Camp celebrated its 10th anniversary this summer, welcoming about 400 girls to the St. Norbert campus for a week of fun confidence- and esteem-building activities. The camp, for girls in grades 1 through 8, aims to build leadership skills, foster positive body image and encourage girls to set high-reaching goals. “This camp is so incredibly important just to continue to let girls know that they can do anything; they can be anything. There are no limits,” says Chelsea Faase ’08, GLAD Camp director and coordinator of youth programming for St. Norbert College. About 10 campers took part in GLAD Camp in its first year, and the camp has grown exponentially since then, Faase says. The camp takes place annually with two sessions in June and July. “GLAD Camp brings out the best in everyone,” says Ava Hoffman, a 12-year-old camper. GLAD Camp is taught by Wisconsin-certified female teachers who are chosen for their ability to serve as positive role models. In addition to self-esteem- and leadership-focused activities, the program aims to build campers’ confidence in math, science and technology, and promotes healthy life choices through nutrition and exercise. 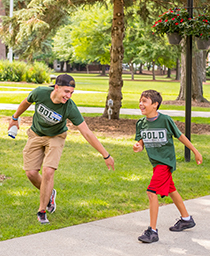 About 200 boys in grades 4 though 8 spent a week exploring their potential at St. Norbert College during BOLD Camp, a summer program that aims to help boys become thoughtful, confident, empathetic leaders. BOLD Camp takes place each July.